Challenge: Helping a then little-known sealing joint venture between a German company and a Japanese company communicate the benefits of its lean manufacturing program, when almost no supplier in North America was actually practicing lean production. Approach: Start with a media audit to gauge awareness and opportunities, then move into media relations — starting with a press briefing featuring The Machine That Changed the World author James Womack — then conducting ongoing media relations activities. 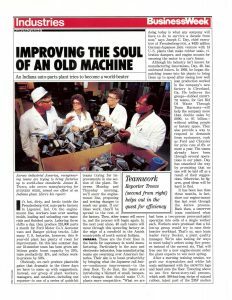 The embedding of BusinessWeek’s Detroit bureau chief on a kaizen team in a manufacturing plant in Indiana yielded a two-page story in BusinessWeek – which itself was read by an automaker CEO and helped start a close relationship with that automaker, ultimately yielding a tripling of annual sales (worth tens of millions of dollars) to that customer. Numerous news conferences, several CEO speaking opportunities, hundreds of media interviews and features, millions of media impressions and 24 years later, Bianchi PR is still working with Freudenberg NOK. BPR’s Top 25 PR Projects is a biweekly profile highlighting some of our favorite client projects, as we commemorate Bianchi PR’s 25th year in business.